It’s going to be 85 in Greensboro, NC today, but cooler weather is just around the corner! How do I know that? Well, I just walked through our Sure-Cure air makeup unit (AMU) production shop, and things are hummin’. We have four units on the bench in process and several more in the queue this week. These Sure-Cure AMU’s are in big demand. ETL-certified and tested, they are among the safest units on the market today. The Sure-Cure will provide gas-heated warm air inside your spray painting booth to speed curing time, even on the coldest days! With a guaranteed 80 degree rise over ambient air temperature, if it is 0 degrees outside it will be 80 degrees inside your booth! No more waiting hours or days for dry time. Plus you can put it into cure mode at the end of the day and go home. 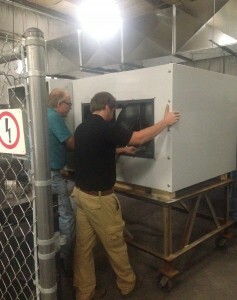 The unit will shut off automatically when the paint is cured. If you have an Air Makeup Unit that is more than 10 years old you may be a candidate for a new high-efficiency Sure-Cure AMU. Many of the old style Air Makeup Unit’s contain heat exchangers that can crack over years of use. This greatly reduces the ability of the unit to heat the air to the desired temperature. It could also result in dangerous fumes being emitted into your booth or painting area! Our units are popular because Standard Tools is committed to a 2 to 3 week turnaround in producing these units, even in the winter months. Other manufacturers take 8 to 12 weeks to ship an AMU! So get your order in today, and be ready for the cold when it gets here!